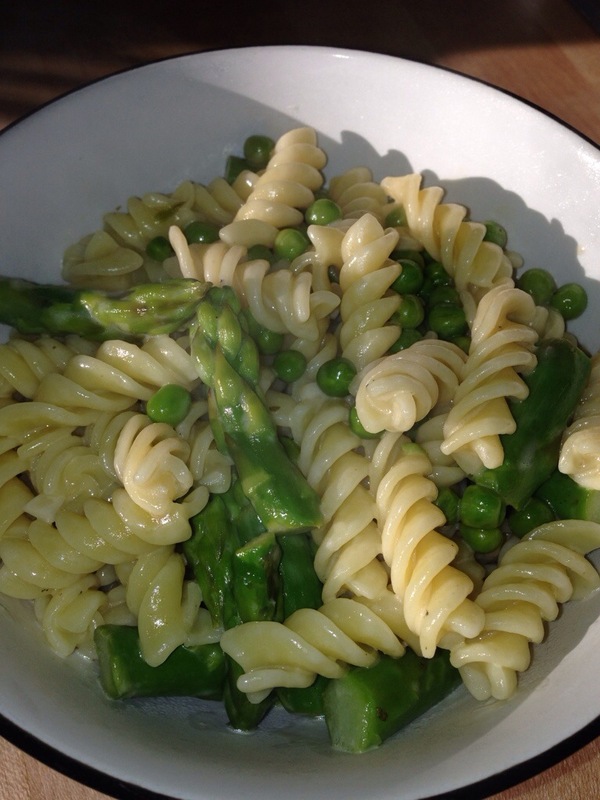 I knew once the weather started to “turn” that I too was in the mood for a light pasta with plenty of fresh, spring vegetables. I’m not really one for alfredo and cream sauces as I feel they’re so thick, heavy, and pretty terrible for you – much to the dismay of my husband. I was really pleased to come across this recipe from Cooking Light – they’re constantly working on lightening up dishes without sacrificing flavor. Thus, a cream sauce that was ‘lightened up’ would please both the palates and waistlines in our home! Cook pasta until just al dente. Add the sliced asparagus during the last minute of the pasta boil. Drain the pasta mixture and return to the pot; add the peas and mix around (the heat will thaw the peas). Heat a large skillet over medium-high heat; melt the butter. Add the garlic to the pan and sauté for a minute. In a small bowl, combine the broth and cornstarch until well-blended. Add this broth mixture to pan and bring to a boil. Cook 1 minute or until thick, stirring constantly. Remove from heat. To the pan, add the cream, lemon juice, salt, pepper, and cayenne. Add in the pasta & vegetables and toss to coat. Serve immediately, with parmesan and parsley on top (if you like). This dish was incredibly delicious and perfect for a lazy Sunday evening. It was fast and very easy to make. The cream and lemon flavors balance each other out really well and highlights the asparagus and peas. There were absolutely zero leftovers for the next day, so I’m not quite sure how well this would reheat – though I imagine it would be just as fantastic the next day.